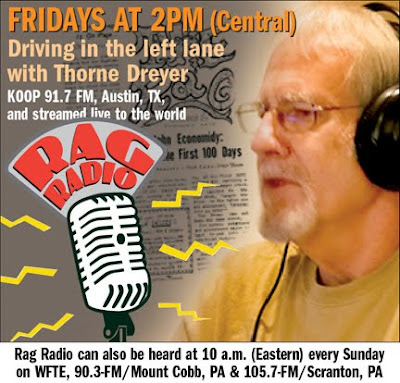 The Rag Blog: Joan Wile : Calling All Grannies! Another grandmother against the war. Photo from cessemi's photostream / Flickr. NEW YORK CITY -- There we were, last Wednesday as usual, our little straggly group of elderly grandmothers and supporters standing on Fifth Avenue in front of Rockefeller Center chanting, "BRING THEM BACK... FROM AFGHANISTAN AND IRAQ! STOP THE KILLING NOW!" We were into our eighth year of our Grandmothers Against the War weekly late-afternoon one-hour vigil, begun on Jan. 14, 2004 and held continuously until now with hardly a single break, no matter what the elements have thrown at us. On this particular Wednesday we were down to only seven protesters, a disappointing decrease from our usual approximately 15. Of course, the weather had something to do with the meager turnout -- New York City was still recovering from the multiple onslaughts of snow crippling people's ability to get around. While standing there (our aging bones making it painful after the first half hour), we began discussing the situation in Egypt. We wondered if there were any way at all for there to be a similar eruption of public discontent here in the U.S. Sadly, we concluded it was extremely unlikely. Oh, yes, we peace grannies and the Veterans for Peace who join us every week are passionate about our cause. We deplore the wars in Iraq and Afghanistan. We are horrified about the loss of American military and civilian life in both countries (still ongoing in Iraq, despite the perception encouraged by the muted reporting in the media that implies otherwise). We lament the obscene amounts of money tossed away on unwinnable and unjustified wars as the funds for our domestic needs dwindle away to the point where our citizens are in desperate straits. Yes, we are concerned enough to take to the streets and try to bring awareness to the indifferent masses of people passing by us that we are in critical trouble, that we must end these wars and occupations for our very survival. But, we are so few. There are always a handful of people walking by who acknowledge us, give us a thumbs up or a "Thank you," as they smilingly continue on their way. Usually, those sympathizers are from other countries -- our sense is that people from abroad absolutely hate our wars. But, mostly, passers-by pretty much ignore us. We assume that this apathy is wide-spread throughout the United States. We marvel at the fact that the Tea Party has been able to mobilize people to hit the streets, and are displeased that their causes are so antipathetic to our beliefs. Will the Tea Party be able to foment a revolt similar to Egypt's? I hope not. But, why can't WE even begin to goose our population into demanding we end the wars? It's a strange dichotomy -- the issues that people are really heated about -- jobs, inferior education, inadequate health care as prime examples -- cannot be solved until we bring the money home along with the troops; yet, the unconscionable conflicts are almost never mentioned in politicians' speeches or media editorials. PEOPLE DO NOT SEE THE CONNECTION! 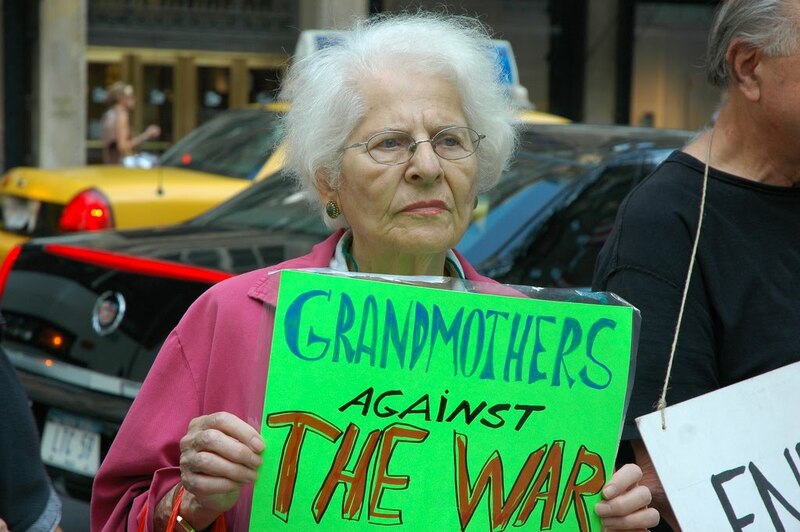 I've concluded that the anti-war grandmothers' job is to make that connection in people's minds. I'm trying to dream up an action that will gain enough attention to start infiltrating into people's consciousness. -- with their ideas and suggestions about how we can create a grandmothers' movement that will wake up America. And, beyond that, let me know if you will join with me and my peer grannnies to make it happen. Grandmothers are thought of as wise, nurturing, and balanced. People will listen to us if our message is made available to them. Let us take off our night caps and don our thinking ones. We know what's at stake -- the future of our children and grandchildren. We must do all within our power to end these wars and foster a world of peace for them. Hurry -- we have so little time!